"Do your best, Iwaki" Sticker:PROJECT 2 DONATE:WA WA PROJECT-Social Creative Platform for Opportunity-Know and support projects in eastern Japan ! Kept moving by the things we each "enjoy". Mizuki Yuasa is active in Iwaki City as an illustrator and designer. Many of his clients are local companies, but following 3.11 in 2011 the situation surrounding his underwent a total change. 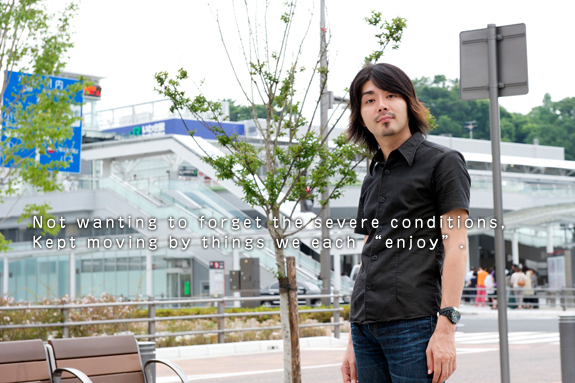 "It was exactly one year after quitting my job working for a company to became freelance that the earthquake struck. I had designed for local customers at the time, but while the difficult circumstances continue, I'm still in a situation where I'm unable to do work relating to design and illustration." In these conditions, one of the things Yuasa engaged hisself resounded strongly. This was the sticker "Do your best, Iwaki" which, within the city limits could be seen stuck to the rear windows of a number of cars. "About one week following the disaster, the key word "Do your best, Iwaki" made a frequent appearance on twitter. A friend suggested "why don't we make a sticker? ", and while thinking about who would design it, I raised my hand to take on the task." 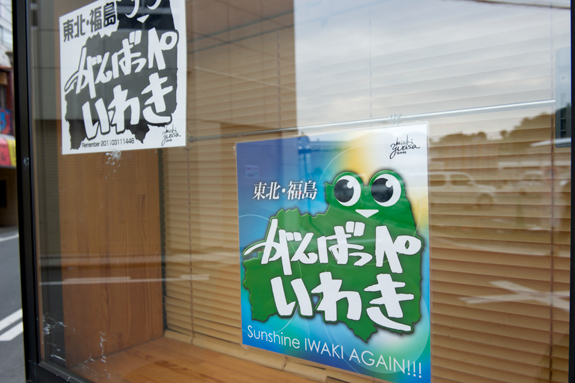 At the time of its production, many people displaying the stickers were people from Iwaki City. However, by May there were frequently more enquiries from people outside of Fukushima Prefecture. These were people originally from Iwaki City who had the strong thought to do something for the community. "Almost four months have passed since I made the sticker, but I still want to continue with it. From now on, there will be fewer instances of appearing in the news and other media, but people are still suffering from the disaster in the affected areas. I don't want people living outside of Iwaki City to forget this, and it is with this thought that I am continuing." The stickers pass into the hands of people who feel for their hometown, connecting with their thoughts. It was through these links that the actions of Yuasa are developing in an unexpected direction. "In talking with all kinds of people, I had an invitation to show the work of young artists of Iwaki City from someone working for a company which organizes events in Tokyo. And so, in June of 2011, the exhibition and sale of work took place in four locations within the city. This has triggered the thought of wanting to create opportunities for people outside of Iwaki City to see the work of these artists, and from now on I want to think about what can be achieved with the people met in doing this." As creators, is there something we can convey? Turning towards other communities, can we not promote the appeal of our town? With this in mind, Yuasa began the online portfolio "Creators Portfolio" in which the work of illustrators and designers working locally could be viewed. With the themes "Do your best, Iwaki" and "No Harmful Rumours", this site conveys a message which enlivens the community through artwork, while also taking the burden of giving new employment opportunities to illustrators and designers who lost their jobs following the effects of the disaster on local clients. "I'm continuing with these activities with fervor so that not just I but many other different creators can return vitality to the town. By working in this way, there have been opportunities for all kinds of people to see our activities, and this has also led to some paid employment. I myself feel that being given these kinds of opportunities is the biggest form of support there is." Now in July 2012, the "Creators Portfolio" has developed to become "FUKUSHIMA CREATORs NOTE: WA-KARAMARI". It is not only for creators who have a connection with Fukushima to promote their activities both within Japan and overseas through an online shop and SNS, but also has widened its horizons to the holding of a real group exhibition. In addition to this, from before the disaster Yuasa had been involved in the activity "Parkfes" . Between April and November, using the park in front of Alios Iwaki Performing Arts Center as venue, a festival centered around markets and music events was held once a month, but there was no choice but to cancel the event following the disaster and Fukushima Daiichi nuclear incident. The reason for this was that even by May 2011, Alios Iwaki Performing Arts Center was still being used as an evacuation center, and there was concern about the level of radiation in the park. However, even after the decision was made to cancel the event, members of the organizing committee worked towards its reopening in 2012. Measurements of the radiation levels in the park grounds which served as the venue began, discussions continued, and in April 2012 "Parkfes" was relaunched. After the disaster, a number of support events were held, but few continued to be organized. Within these conditions, Yuasa made a firm decision to continue "Parkfes", as the committee members were about to start out with the thought of wanting "to create an oasis where people can re-encounter each other". In the restored "Parkfes", in addition to the market and music events, the power for the sound systems is supplied by natural energy, there are dance workshops and a petit motor show, and while bringing about cooperation with outside groups the event continues to grow in scale. The name "Fukushima" has become known around the world in an undesirable way. Yuasa's thought is to change this negative word into a positive one through artwork. "Before the disaster, "Fukushima" was most likely an unknown place name to many people. Perhaps it has become a negative word, but we have to make it better taking now as the starting point. As a person living in Iwaki, I think I have that duty. The truth is that the conditions are severe, but people are living normally in Iwaki City, and if you go to a bar you can drink as usual. It is not as if everything about our everyday lives is negative. Of course, I don't want everyone to forget that there are still harsh conditions, but if each and all find their own enjoyment, I also want people to remember that there are some of us enjoying ourselves." Funds for the holding and administration of "Parkfes" (held 8 times annually), and funds for the administration and holding of the exhibition "Karamari".